Set shift point without a tachometer! Dial in desired shift point - light flashes on. At pre-set RPM, light will flash on. Range is 3- 12,000 (X200) RPM. Does not require separately purchased RPM modules! Some applications may need a late-model tach adapter. Hit your shift points perfectly with these Proform Adjustable RPM Shift Lights. Easily set shift point between 3,000-11,000 RPM without needing tachometer. 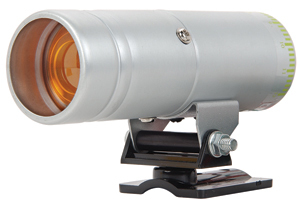 The easy to use analog adjustable shift lights measure 5" L x 3" H with a 1-5/8" diameter. These high quality units are available in a blue, black, red and silver finish and feature a bright amber bulb. Proform's new Mini Digital Shift Light and Diagnostic Tachometer can be easily installed in vehicles with 1-12 cylinders. Measuring at only 4-1/4" L 1" H with a 3/4" diameter, this 3 LED light will give you the signal when it's time to shift. All settings are easily controlled with two buttons. Features include a 100-12,000 RPM range in 100 RPM increments, Cylinder range of 1 thru 12, Adjustable brightness for the digital display, and a display on/off feature when in use. You can even use it when you're in the garage tuning your ride. Easily detach the shift light from its mount and place it on your dashboard so the tachometer digital display is facing out so you can see it while you're tuning. Imagine that...no more yelling into the house to get somebody to tell you when you're at 3000 RPM's. Simple, Innovative, Affordable...that's PROFORM! NOTE: Tach adapter may be required. hi, can this shift light be hooked to the hei connection if a tach is there also ??????????? Yes you can hook this up with a Tach.